It is not often a product comes along that defines a whole new audience for its type but the DaVinci JR did that. 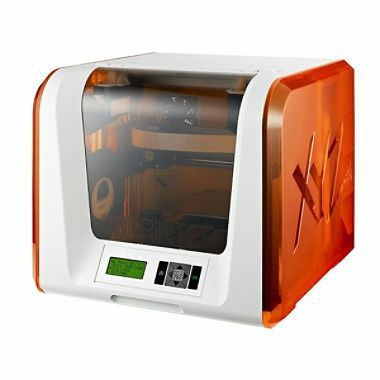 When it was released last year it was the first truly consumer targetted 3d printer. Yes there had been other attempts to get in that market before but they had come from 3D printer manufacturers that had a Maker community point of view. A lot of knowledge was assumed and very little support given. Now XYZ entered the market from a conventional consumer ink-jet printing background. You may not have heard the name before but you have probably used one of the products their parent company manufactures for some of the major printing brands. They applied some of those principals of conventional printers to create a product at an unheard of price point of sub £300. Now one of the things they did was to tie users in to using their own brand 3D printing filament which got some of the maker community up in arms who were used to using any old filament. Now there are some advantages to XYZprintings approach. The fact that the filament is supplied with an RFID chip with information about the type of material used makes set up a doddle and puts less risk of damaging the extruder head with incorrect settings. Something that inexperienced users have been known to get very wrong with other brand devices. When you consider that some other brand extruder heads cost more than the whole Da Vinci Jr you could buy a lot of filament for that money. We found that the price premium for the Da Vinci Jr filament was not excessive and that you could get some very good deals by shopping around. With the target audience we think this is a reasonable approach. To give them their due XYZPrinting are about to launch a Maker community targetted printer that will not have this restriction but that is a different market. Unlike some 3D printers we have tried the Da Vinci Jr was really easy to setup. Although the manual seemed a little intimidating it was purely a matter of connecting a tube from the extruder head out the top of the unit and back in to the filament feed from the reel and then putting the suppied tape on the printing plate. This latter is needed to allow for a good contact with the extruded filament so that the initial layer stays in place. The supplied software works very well allowing you download 3D printing files from the web and send them to the printer to process. Complex models can take some time to print but are very accurate and the lack of any need to calibrate before getting started is a joy. We did have a couple of failed prints - these were normally where we were trying to print shapes that jutted out from the base or where the base was narrower than the rest of the print. There are options to work round this by printing a raft as a wide base and using thin supports to as they say support the model. The software can apply this automatically. Using these options solved all our failures - although we did have to use a sharp knife to cut away the supports. As with all 3D printers some maintenance is required including cleaning the extruder head from time to time. These were well explained in the manual and unusually all the tools needed were supplied. The question might be asked why you would want a 3D printer? Well if you are creative, or have creative kids, there are loads of 3D modelling packages out there, indeed XYZ themselves are just launching one, with which you could use the printer to turn your designs into real objects. I personally found a really good use for it in reproducing the broken clips for my footplate in my kitchen whch were no longer made. We also used the printer to make a charging stands for the Pebble Watch reviewed this issue. The file for this along with thousand of other objects was avaialble online. The possiblities are endless. You can probably tell we really like this printer it truly opens up the market to the masses and is a joy to use. We can't wait to see what XYZPrinting does next.